By substituting TelcoBridges's Tsig gateway with a Tmedia gateway we can combine the functionalities of both the SSP and the STP together. TelcoBridges' Gateways are designed from the ground up to serve as a multi-purpose platform. As such, our Gateways are capable of performing much more than simply acting as a signaling or media Gateway. Our Tmedia Gateways can not only route media but also signaling, addressing SIGTRAN/SS7, TDM and VoIP media switching all in one box. This means that one redundant Tmedia Gateway can fulfill the role of multiple pieces of equipment, and as a result, enhance the performance, redundancy, and reliability of systems for a fraction of the cost of traditional multi-unit Solution. 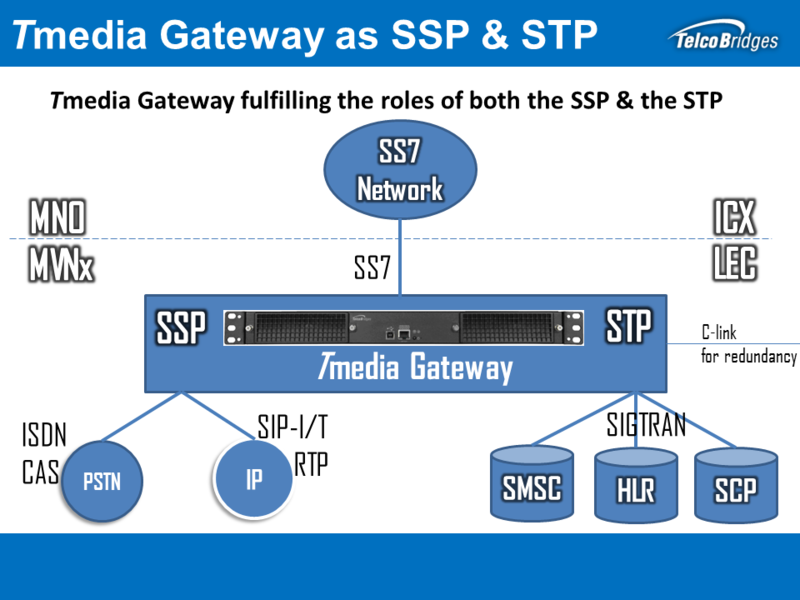 Realise significant acquisitional and operational cost savings by fielding a Tmedia gateway which has full media gateway functionalities, and thank's to its onboard SS7 stack, full signaling functionalitie combined into 1 unit.